I really enjoyed reading Awaken by Katie Kacvinsky! I loved reading about the digital, “safe” life that Katie Kacvinsky created in this book, as well as it’s consequences! For me Awaken was a cross between The Academie by Amy Joy and Delirium by Lauren Oliver. Even though at times she was a bit too needy and “plugged-in”, my favourite character was Maddie, because of her rebelliousness and stubborn nature. I love the cover of Awaken, it combines both the natural and digital aspects from within the story and depicts them beautifully! 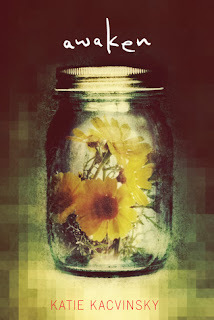 I really like how the pixelated effect is coupled with the simple, yellow flower trapped in the jar, much like the how some of the characters are trapped in their digital worlds!